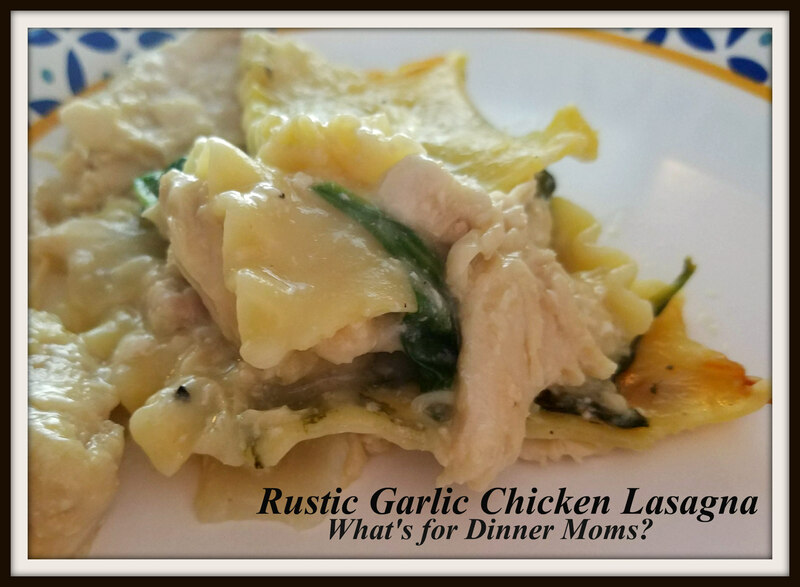 Rustic Garlic Chicken Lasagna – What's for Dinner Moms? I am always saying try to make do with what you have on hand. This was definitely one of those meals. I had a package of chicken that I HAD to use or I was going to have to throw it away and I hate wasting food. I knew I was going to be gone most of the day so it was going to have to be a slow cooker meal day. Which was fine but I was not looking forward to chicken and rice or chicken and egg noodles. I wanted something different. That is how this was created. During the day while the chicken was cooking I was thinking of all the ingredients I knew I had in the refrigerator and pantry that I could put together with the chicken to make something out of it. I had a box of lasagna noodles, some mozzarella and cheddar cheese, some spinach, and lots of garlic cooking with the chicken. Rustic Garlic Chicken Lasagna was created. It is a very simple dish that wasn’t too heavy and was very satisfying. The chicken and garlic in the slow cooker had my house smelling amazing before we even put the dish together. Both kids really liked it and I did too because it wasn’t overly heavy and didn’t settle like a brick in my stomach. Served with a hearty green salad we had a delicious meal. In slow cooker place chicken, garlic, onion, and chicken stock. Cook on low 6-8 hours until chicken is cooked through. Remove chicken to shred or cube chicken to use in lasagna. Mix corn starch and cold water until corn starch is dissolved. Mix into slow cooker liquid and stir well. Add chicken into the slow cooker and turn slow cooker up to high and cover. Mixture should thicken to gravy like consistency. Taste and adjust spices as needed. Boil noodles according to package directions. Separate noodles after cooking to keep them from sticking together. In a 13″ x 9″ baking dish sprayed with non-stick spray spread about 1/2 cup of chicken gravy. Then top with the first layer of lasagna noodles that slightly overlap to cover the bottom of the pan. Then top with a layer of spinach, mozzarella cheese, and chicken and gravy. Repeat layers 2 more times and then top with cheddar cheese. Cover pan with aluminum foil. Bake dish covered for 40 minutes. Uncover dish and continue cooking for 20-30 minutes until center is hot. Remove dish from oven and allow to rest for 5 minutes before serving. This looks delicious! It’s a must try recipe! yumm love this inspired meal Marci!